When it comes to health, things are quite simple: you are physically fit, you are also healthy. However, physical fitness can help you function better overall, enjoying renewed levels of energy and feeling great all the time. If you find the power to focus on keeping a healthy diet and engage in physical exercise on a regular basis, then you are on the right track. For those less motivated, we have gathered a number of different ways that are meant to help you stay fit and healthy at the same time. It does not take a genius to understand that physical exercise stimulates the body from multiple points of view. 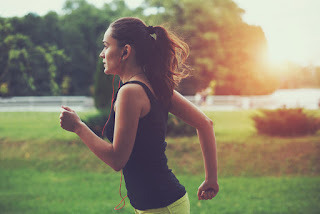 At first, it might be more difficult to wake up bright and early but, with the passing of time, you will see that there is no better way to stay fit than through a morning workout. You can engage in any physical exercise you are interested in; you can run, jog or even go for a swim. It does not matter, as long as you are physically active. It is a known fact that inflammationis one of the contributing factors to chronic health problems, such as obesity, diabetes or heart disease. What you probably don’t know is that you can prevent such problems by including more anti-inflammatory foods in your diet. Among the possibilities, you have available there are dark leafy greens, tomatoes, nuts, extra-virgin olive oil and fatty fish (salmon, mackerel, tuna, and sardines). Fruits, such as strawberries, cherries, blueberries and oranges also possess anti-inflammatory properties, but they should be consumed in moderation, given the high fructose content. If you are stuck at the office for eight hours, do not spend the rest of your day at home, as you will be inside as well. Spending more time in the open outdoors is more beneficial than you might think; the fresh air will stimulate your appetite, not to mention being in contact with nature will help you eliminate stress and anxiety in a natural manner. You can also engage in physical exercise outside, go for a run or even for a simple walk in your favorite park. Playing your favorite sport is a good idea as well; you can engage your friends, enjoying a good game of tennis, basketball or baseball. When you feel lonely and isolated, you are also more likely to suffer from various diseases, as your immune system tends to let its guard down. Socialization can help you escape such feelings, feelings that you probably compensate with food. Moreover, when you engage in activities with friends, you will stimulate the release of happiness hormones at the level of the brain (serotonin, dopamine). You can also take part in group activities, taking various courses or classes that might benefit your personal interests as well. Working out is a great way to meet people, so do not hesitate to sign up for a gym membership as soon as you possibly can. No matter how tempting it might be to order out every night, you have to understand that there is nothing healthier than a home-cooked meal. Plus, when you try out different recipes, it is practically impossible not to have fun and feel amazing. It is a known fact that people who cook their food can maintain their weight effortlessly, presenting lower levels of blood sugar, triglycerides, and cholesterol. Cooking will also help you reduce the overall intake of processed food, which will allow you to stay healthy for a prolonged period. Most people only visit their doctor when something is wrong. However, if you want to stay fit and healthy, you have to consider visiting the doctor for prevention and nothing else. Get yourself checked out on a regular basis, in order to determine that there are no chronic conditions to worry about. The doctor can also test your current level of effort, which is a predictor of heart health. Moreover, the doctor can recommend a healthy diet, along with vitamin supplements to correct any existent nutritional deficiencies. These are only a couple of ways in which you can maintain your current level of fitness and stay healthy. It is important to follow a healthy diet, one that consists primarily of fresh foods and vegetables. At the same time, you have to avoid periods of prolonged sitting, as these can be quite damaging.